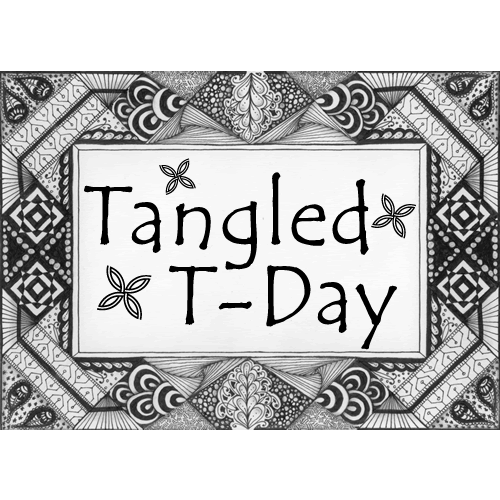 Welcome to my first-ever Tangled T-Day! OK, so it’s not really all THAT different from my previous Tangled Tuesday series – I’ve just decided to tweak the process a little (check out this post if you’d like more details), and to mark the transition I’m re-starting my numbering back at the beginning. Hope you enjoy the (ever-so-slightly) new direction in tangling updates on Alphabet Salad! I mentioned in one of my catch-up posts over the holidays that I’d had an opportunity to work with CBC Windsor in filming a short segment on Zentangle. At the time I wasn’t sure if or when the piece would air, but since then it did, and I wrote all about it over on my Laurel Regan, CZT blog – pop on over and check it out! Going forward, my Zentangle classes for the first three months of 2017 have been scheduled, and all are open for registration. If you’re in the Windsor-Essex (Ontario) region, I’d sure love to see you there! Since my previous post I have learned the following new-to-me tangles. You may think I’m a little crazy, but I’ve decided to publish a second colouring book as a followup to “Ten Thousand Tangles: A Zentangle-Inspired Art Colouring Book”. I’m off to a good start, as over the holidays I was able to complete three pages! At this point I’m aiming for a total of 20 drawings (same as the previous book), with publication at some point in the fall. Watch this space for more details (and in the meantime, feel free to pick up a copy of my first book and get to colouring)! This year I’m going to be working on an art journal project, along with a group of CZTs and tanglers who will be doing their own, creating a page each week based on a group prompt. 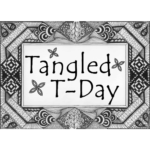 While the group itself as well as the details of the prompts are members-only, we’re each able to share our own work outside the group, and since most (if not all) of my pages will include tangling I thought I’d post them here as part of Tangled T-Day. 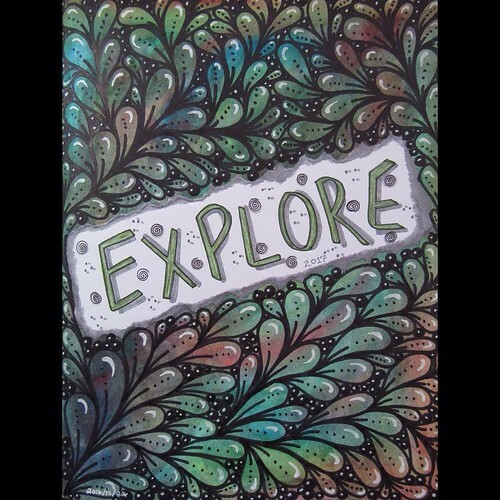 The book I chose for my own project is a Strathmore Softcover Mixed Media Art Journal, which is 7.75″ by 9.75″ in size. I’ve only done one page so far (a pre-2017 warmup), which you may have already seen in a previous post, but for the benefit of any who might have missed it I’ll share it again here. I started this page by laying down a watercolour wash with no particular plan or colour scheme in mind – I just had fun playing! Once it had dried I added my word of the year and then covered the background in the tangle pattern “Flux” in black Sharpie. The finished product is quite different from my usual tiny and fairly intricate work, but I thoroughly enjoyed the process and am pleased with the results of my experimentation. Wow….these are so beautiful….and so soul-fulfilling they must be to you too….! This is most beautiful Tangle I have come across Laurel. I have this habit of drawing tangles with coloured pens when I am seriously planning something. It is like a mind exercise to me. I keep drawing line after line and make patterns (i don’t know what). Some turn out to be really great. But my purpose being the plan and not tangle, I never take it seriously. Thank you so much! That sounds like a great way to incorporate tangling into planning and add focus to your thoughts. Thank you so much! Yes, I have taught people who are total beginners and they were able to learn just fine. I think you’d enjoy it!